Looking to spice up your games room? In this buyer’s guide, we’ll review the top 8 shuffleboard tables on the market right now. We’ll assess each product based on its durability, performance, and value for money. 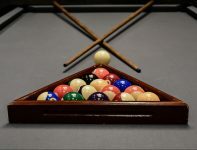 After that, we’ll outline some key things to consider when buying, to help you pick the perfect shuffleboard table for your specific needs. Photo by Chris Pimlott licensed under CC BY-SA 3.0. First, we’ll review the 8 best shuffleboard tables on the market right now. If you’re looking for a high-quality shuffleboard table, this is an excellent pick. Fairview have gone for a butcher-block surface and finished it with polymer, making for an incredibly durable table. This material simply won’t warp, unless it’s exposed to a heap of direct sunlight. Plus, you get complimentary shuffleboard salt to keep your surface as slippery as possible. This board is also completely flat, meaning you don’t have to worry about keeping your climatic adjusters in-tune, since there’s no concavity to the surface. However, there are chrome leg levelers, which are useful in case your floor isn’t completely flat. Apart from the excellent build quality and durable surface, this table is also awesome in that you get an extra-large accessory cabinet. Located in one of the legs, this hidey-hole is great for storing the 8 included pucks, shuffleboard salt, and your towel for keeping the surface clean. At 12′ long and 30″ off the floor, this table offers an authentic shuffleboard experience without taking up too much room. It’s also very easy to assemble, although the parts are quite heavy and a little difficult to maneuvre. The only real downside to this board is its price – it’s fairly expensive. However, you definitely get what you pay for. Decent size, but not too big – suitable for smaller games rooms. Completely flat butcher-block surface – easy to maintain. Comes with shuffleboard cheese and a storage cabinet. Expensive, but definitely worth it. We’ve looked at a premium option, but what can you get on a mid-range budget? This Challenger shuffleboard table is pretty reasonably priced, especially if you get one of the smaller ones (9′, 12′ and 14′ tables are available). 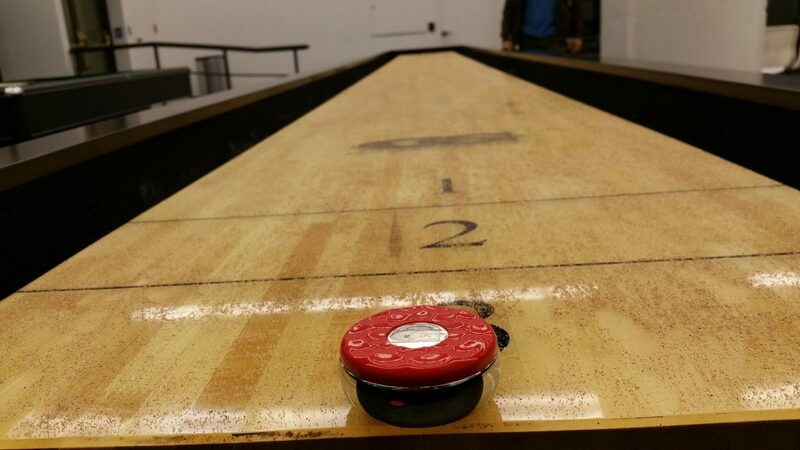 Despite the price, you still get a heap of really nice features which make for an awesome shuffleboard. The butcher-block surface is coated in polyurethane, which is both very slick and super chip-resistant. There’s also four independently-adjustable legs, which you can use to keep the table perfectly level on any surface. What’s more, the Challenger comes with an 180-day warranty for peace of mind when buying. Hathaway also promises that the table will arrive with you in perfect condition, which is great – we all know how careless delivery people can be! Surprisingly, there are included climatic adjusters underneath the surface, allowing you to customize its concavity. You even get a storage cabinet, and eight included pucks. OK, the table comes with a heap of features, but how does it actually play? Provided you take care of the top and keep it out of direct sunlight, your pucks will glide beautifully on this table. Considering how reasonably priced it is, the Challenger’s performance is simply superb. Reasonable price considering how well-made it is. 180-day warranty + guarantee against shipping damage. N/A – excellent table for the money. 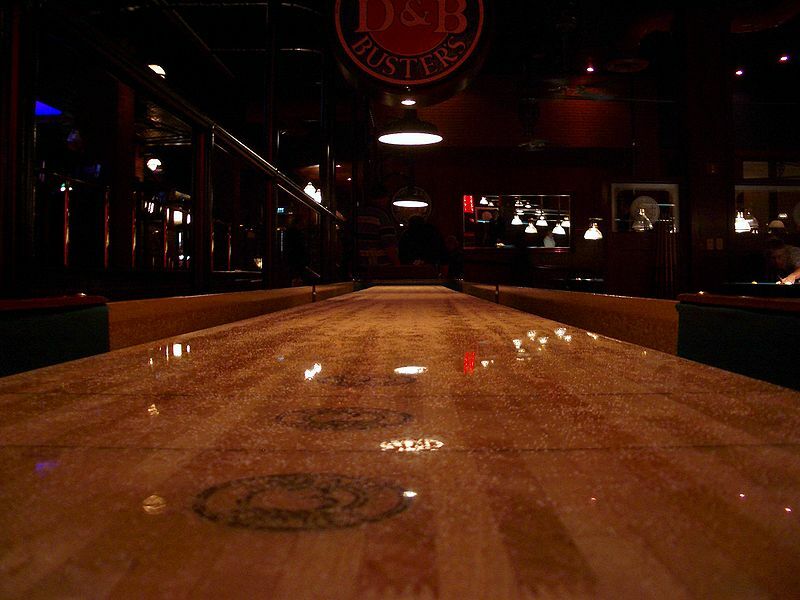 For the real shuffleboard pros out there, nothing beats the feeling of playing on a full 22′ table. Because this board is designed for experienced players, it features a Canadian Maple butcher-block surface, an electronic scoring mechanism, and pro-style threaded climatic adjusters. However, if it’s quality you want, but you don’t have room for a full-length board, you’re in luck. There’s also a 14′ and a 19′ version available, which are fortunately a little cheaper. Overall though, this is still a pretty expensive board, no matter what size you get. Playcraft definitely have the basics covered – they haven’t just focused on making a beautiful shuffleboard. This table comes with shuffleboard wax, eight pucks, individually-adjustable legs, and playing instructions (not that you’ll need them!). Plus, it’s fairly easy to put together. The only thing we can fault this board for is the lack of a warranty. Although it’s incredibly well-made, we think there should be some sort of long-term guarantee against any of the wood chipping or warping, considering what you’re paying. Adjustable legs & climatic adjusters included. Available in a range of sizes, including the full 22′. For those on a tight budget, there’s actually quite a few good-quality but reasonably-priced tables on the market. The Atomic Platinum is one such option. Despite how inexpensive it is, you still get a flat, poly-coated playing surface, which provides excellent glide. It also comes with a nice and simple abacus-style scoring system, so you can keep track of how much you’re winning by! Surprisingly, the table itself is quite heavy (and very sturdy), and the pedestal legs have levelers, which prove to be quite useful. Although they can be a little tricky to adjust, they’ll do a good job keeping your surface stable. So what exactly is the downside to paying a little less? Firstly, you’re limited to a 9′ board. If you’ve ever played on a full 19’/22′ shuffleboard table, it’s going to feel a little short. But on the plus side, it’s really easy to get into your games room, and quick to put together. Another potential downside is the surface. Although it offers excellent slide (particularly when paired with the included shuffleboard wax), it can wear out if you use it very frequently. You might want to apply a new poly/varnish coat after using this table for a year or two. Includes pucks & shuffleboard wax. Surface can wear out after extended play. Most 9’/12′ tables don’t come with a warranty – this board is the exception to that rule. Barrington offers a 90-day guarantee against defects with this table, offering a little extra peace of mind when buying. You’re unlikely to need to take advantage of this offer though. The table is made of furniture-quality wood, and comes with a UV-coated, scratch-proof surface to keep your board in tip-top condition. It’s not just the surface that’s sturdy though. The legs offer incredible stability, and the outer edges are very strong indeed. If your shuffleboard games tend to get a little intense after a few drinks, this toughness is an awesome thing to have. Considering what it costs, this table looks surprisingly good – it’d fit in perfectly in a retro-style games room. What’s more, it comes with everything you need to begin playing, including shuffleboard powder and an abacus-style scoring mechanism. This means you don’t have to worry about ordering quoits/any other stuff to get set up. The only real downside to this table is its cost. Considering that it’s on the small side, we think Barrington could reduce the price a little. In saying this, it’s still fairly cheap. Super-sturdy design – tough surface. If your games room is already full to the brim of pool/foosball/air hockey tables, but you’ve got a lot of space on your patio/deck, getting an outdoor shuffleboard table is an excellent idea. To help this table stand up to the elements, Playcraft have gone for thick, powder coated aluminum materials rather than treated wood. As a result, this board is very rust-resistant and can even withstand frost, humidity, and direct sunlight without so much as a scratch. But how does the surface work? As you can tell from the pictures, it’s made of a similar aluminum material as the cabinet and the aprons of the board. However, it plays just like a wood surface. This is because Playcraft have coated it in a special weatherproof sealant, which still allows your pucks to glide nicely. Maintaining this table is actually easier than looking after an indoor table. Simply wipe the surface with a wet cloth – you could even hose it down if necessary. Spilled drinks aren’t a problem at all – the Extera is much more capable of withstanding rowdy gameplay than your typical wooden shuffleboard! This is why outdoor tables (the Extera in particular) are quite expensive. However, they’re incredibly versatile, super-durable, and tend to be lighter than indoor tables. Light & simple to assemble. Completely level surface – no chance of warpage. Incredibly easy to clean & maintain. Fairly costly, but you get what you pay for. There are very few really good-looking shuffleboards out there at the moment, especially at this price point. Most manufacturers focus on durability and the quality of the playing surface, which can result in quite bland (but very nice to play on) shuffleboard tables. This option from Carmelli would make an incredibly stylish addition to your man-cave. Featuring a dark cherry laminate around the edges and bronze leg levelers, it’d look particularly good in a retro 60/70s style games room. Another thing Carmelli have prioritized in designing this board is durability. The corners in particular are incredibly strong, which is very useful – these exposed areas can chip really easily. This makes the table incredibly heavy, but it’s fairly easy to put together (as long as you’ve got 2/3 people on-hand). The poly-coated surface holds up well, but doesn’t quite offer as much slide as you’d find on more expensive tables. A few extra applications of shuffleboard salt can help to solve this problem. Great durability – very tough. Very heavy – hard to move around once it’s put together. Could offer more surface slide. Another slightly more style-oriented table is this board from Playcraft. It’s available with either cherry or espresso apron highlights, allowing you to choose whatever works best for your intended table location. This board is a little more expensive than the Carmelli table we just looked at though. There’s two main reasons for this. Firstly, it’s longer (available in 14/16 feet), meaning it offers a more authentic shuffleboard experience. Because the Georgetown is a fairly expensive option, it comes with leg storage and climatic adjusters that are really easy to use. Secondly, this table has a much better surface than the Carmelli shuffleboard. The butcher-block is coated with 10 layers of polyurethane, meaning its shine won’t wear down for a number of years at least. 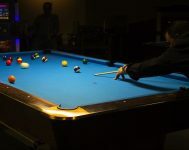 Your pucks will slide really nicely on this table, and the surface is slightly concave, offering an additional challenge for experienced players. Plus, you get specialized wax to maintain the surface speed. Overall, this is an excellent premium option. It has everything you need as a shuffleboard pro, but is still small enough to fit in the average house. Unless you’ve got the room (and cash) for a full-length 22′ table, we’d definitely recommend picking up this shuffleboard. Will fit in pretty much any house or apartment. Now we’ll discuss some things to consider when selecting a new shuffleboard table. We’ll also look at some things you should know about caring for your investment, ensuring your new shuffleboard lasts for decades to come. Generally, shuffleboard tables are a little bit concave (meaning they have a slight dip) in the center. If you put something completely straight across the table (like a level), you’ll be able to slide a piece of card underneath it. On the other hand, there are also perfectly flat shuffleboard tables out there, as well as convex options. If you’re looking for a surface that’ll play just like a tournament table, get a concave board. For a little extra challenge when throwing, choose something with a convex surface. If you wanna avoid the hassle of using climatic adjusters to keep your surface’s curve perfect, get a flat board (more on this a little further on). What are the official shuffleboard table dimensions? 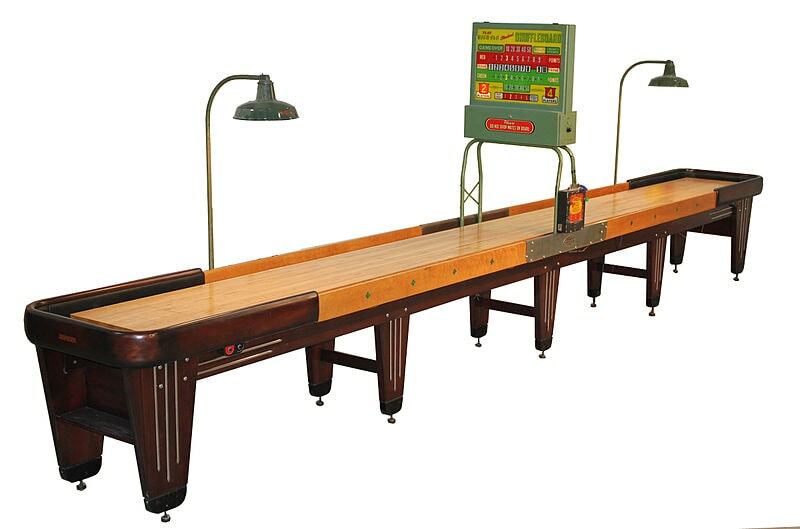 Tournament-level shuffleboards measure 22′ long and 20″ wide. But most tables on the market at the moment are much shorter – typically 9′, 12′ or 14′ long. When choosing a size, remember that you’ll also need some room to move around your shuffleboard if you’re going to be able to use it properly. Don’t get something that you’ll have to put right up against the wall. Also consider how you’re going to get your table into your house/condo/apartment. Most boards come disassembled, but the surface itself is normally a single piece. Grab your measuring tape and check that your doors are wide enough! Photo by Archie licensed under CC BY 2.0. The important markings on your shuffleboard are the two horizontal lines at each end of the table that mark the three scoring zones. There aren’t any strict guidelines as to how big these areas need to be – it depends on the size of your table. Generally though, the 2 and 3-point zones are 6″ deep. To assemble your new table, you’ll most likely only need a screwdriver, a wrench, and a few other basic tools. Most products come with clear instructions and are no harder to put together than an IKEA table. However, you should definitely check what reviewers have to say – some tables are easier to assemble than others. Keeping score is super-important – how else will you trash talk the guy you’re beating?! To make it a little easier (especially when you’ve had a few drinks), most shuffleboard tables have abacus-style scoring systems. However, more expensive options come with electronic scoring mechanisms. These look great, and are very easy to use – you just press a button to update your total. The downside to an electronic scorer though is that it’s normally very expensive – only the premium tables have them. Shuffleboard with an electronic scoring mechanism. Photo by Shuffleboardtodd licensed under CC BY-SA 3.0. The #1 rule is avoid direct sunlight. Not only can it cause the surface to fade, it can make the actual wood warp, which can crack the lacquer/polymer finish applied to the surface. Basement man-caves are a great place! Also, avoid areas in your house where pets/kids can climb on your table easily. Little paws/feet can smudge the surface, and you definitely don’t want your child falling from the table and hurting themselves. This is why table covers can be a good idea (more on this below). You can actually get shuffleboards that are designed to be used outdoors. Instead of painstakingly waxing and wiping them, you can simply hose the surface down and towel it off. They’re sturdy enough to withstand extreme heat/cold, and it’s no big deal if you spill a drink on the surface. This is possible because outdoor tables are made of aluminum rather than wood, including the surface. 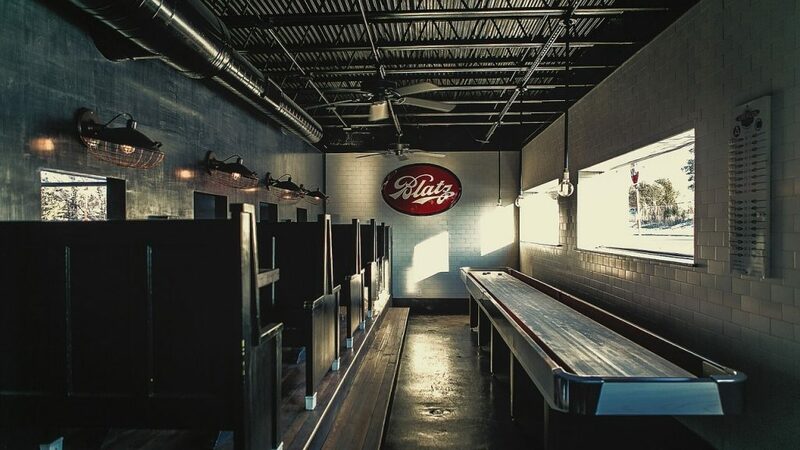 However, they still offer an authentic shuffleboard experience, and the pucks will slide just like they would on a normal table. As a result of their sturdy design, outdoor tables tend to be pretty expensive. It’s probably not worth buying one unless you’ve got a nice spot on your patio for it. A shuffleboard brush, to remove debris from the surface. A shuffleboard cover, again to prevent dust/debris buildup but also to protect against sunlight damaging the table. Replacement pucks – they tend to break more easily when you’ve had a few drinks. Pucks don’t like hard surfaces! Speed powder/wax/sand – AKA little silicon beads. If you’re struggling to get the surface slippery enough, you can use these products to get that little extra pace on your puck. To keep your surface nice and slippery, you need to clean your table about once a week. Polymer finishes can be wiped down with a damp rag – no need for any cleaning agents. If you’ve got a plain wood finish, you’ll need to use a 1:4 mixture of vinegar:water. Use a lint-free/microfiber cloth and gently wipe your table down. Dry it off promptly – if you leave too much water, this can damage the surface. If you’ve got a lacquer finish, you can use high-quality furniture wax to keep your surface as slippery as possible. This only needs to be done once or twice a month – simply use a microfiber cloth as if you were cleaning the surface normally. Finally, you can dust the table with speed power or wipe it down with speed wax to make it a little quicker. This is also pretty important – it should be done about 2/3 times a month depending on how often you use your table. Photo by Gary Denham licensed under CC BY-SA 2.0. To allow you to adjust your table’s concavity, most shuffleboards come with up to 6 climatic adjusters. These are horizontal rods that sit under the surface of your board. In summer, humidity can cause your board to expand, which can mess up its concavity. Likewise, dry winter weather can make the wood shrink a little bit. To reduce your table’s concavity, first loosen the inner nut on each side of the rod. Then, carefully tighten the outer nuts on the same rod. Conversely, you tighten the inner nuts (and loosen the outer nuts) to increase the surface’s concavity. Since even the slightest of temperature changes can affect the wood in your surface, you should ideally use the adjusters every month or so to make small corrections. It takes a little while, but you can sort of develop a feel for how your table plays, and then adjust it when you notice that something’s a little off. An extended warranty. If you’re investing in a proper table, it’s worth having the extra peace of mind that your investment won’t break or wear down really quickly. Easy assembly. For those who don’t use the tools in the garage all that often, you’ll definitely want something that’s not too hard to put together. A good-quality surface. Generally, you get what you pay for – look out for butcher-block, which is made of strips of hardwood. Storage cabinets – these always come in handy. Good reviews. Previous customers are going to let you know if a table has issues. Hopefully you found the right shuffleboard table for your games room or man-cave. If you’re still unsure what to buy, drop us a comment below and we’ll get right back to you.